Rouja Lazarova was born in 1968 in Sofia, in Bulgaria. After the 1989 revolution and the ensuing disappointments, she moved to Paris. She started writing in French and published her first novel Sur le bout de la langue in 1998. It was followed by Coeurs croisés (Flammarion 2000) and Frein (Balland 2004). Her fourth novel, Mausolée (Flammarion, 2009), received warm greetings from critics and readers and was on the shortlist of many literary prizes (ELLE’s Readers’ Prize, Prix Louis Guilloux, Prix Lilas, Prix Soroptimist for best French-speaking novelist). Rouja Lazarova’s work obsessively explores the anguish engendered by XXth totalitarian regimes—fear, manipulations, violence, be it physical or symbolic. But she is also a writer adept at painting intimate feelings, investigating the secrets of one’s body and desires. Her vivid and often metaphorical writing, her sober style pervaded by soft irony are the trademarks of an original voice, probably one of the most gifted of the early XXIst century. Paris in the 1990s’ is the background of an unlikely love affair between a psychiatrist and his young patient. A survivor of the Nazi death camps in his 70s’, he considers memory to be the key to happiness. She grew up behind the Iron Curtain and finds the body to be an obstacle whose limits had to be tamed. Their affair, where passion is intertwined with transgression, both disturbing and fascinating, funny even sometimes, comes out as the necessary consequence of totalitarian memory. It grows in the fleetingness of the moment, haunted by the past but devoid of a possible future. When illness comes into view, it’s like a third person stepping in. Can the two lovers truly love each other at the heart of illness rather than against it? Like an online search, this novel is wrapped around key words such as ‘fear’, ‘desire’, ‘power’. Each word echoes each character’s intimate experience of totalitarian regimes, revived by words, desire and memory in the quiet setting of Paris in the late 20th century. Rather than write a historical novel about Nazism or Communism, Rouja Lazarova wrote about the aftermath. The novel is about surviving, about after-effects and the shortcomings of memory. Her writing is composed, sharp and delicate, often with a light touch of humour. 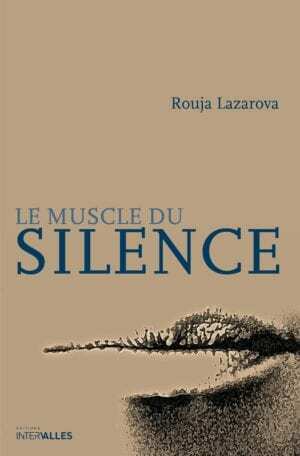 Le Muscle du Silence is about characters who despite a tempestuous past and painful inner struggles manage to fight free of their chains.